Several weeks ago an email from Ryan Wilkins with Pom Wonderful showed up the Inbox with an offer to send a case of 100% pomegranate juice. Of course I replied with an affirmative and the juice arrived within a few weeks, and then about a week after that I created this recipe for marinating a whole chicken with the juice along with other citrus juices for several hours or overnight. After the Pom and citrus bath, the whole chicken is then seasoned with my Finger Lickin Rub and a mixture of fresh herbs, and minced garlic. Then it is set up on an upright stand and roasted until tender. 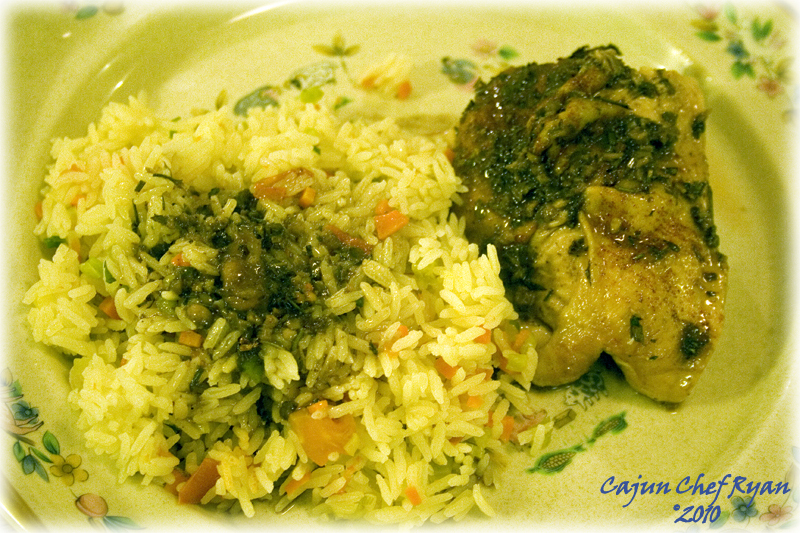 In this recipe, I served it with some basmati rice pilaf and then added the juices as a light sauce over the chicken and the pilaf. Not at all fancy, but it is a frugal and home style meal sure to please a hungry family. 1. Combine the three juices with the Worcestershire sauce and then cover the whole chicken and marinate for several hours, turning the chicken half-way through the marinating phase. 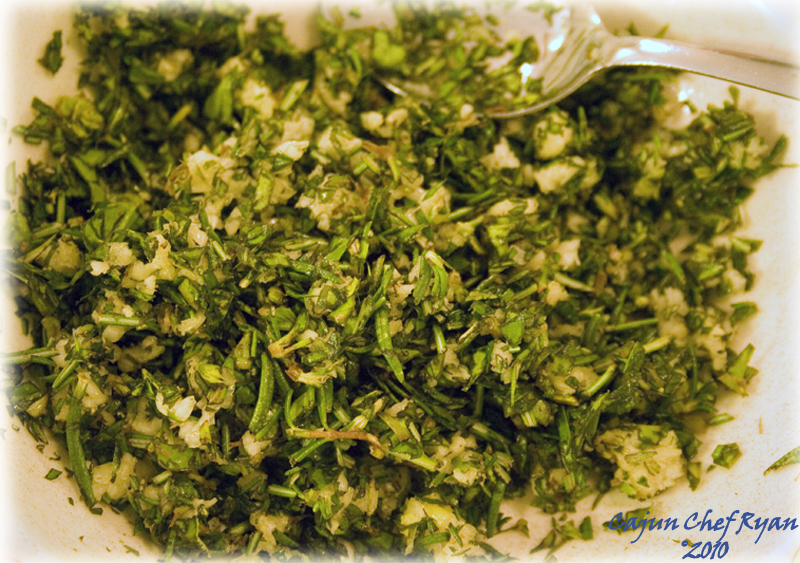 Combine all the fresh herbs with the garlic. When the chicken is done marinating, pre-heat oven to 350º F, and then drain the chicken from the liquid ingredients, and then evenly season the entire chicken inside the cavity and outside with the Finger Lickin Rub. 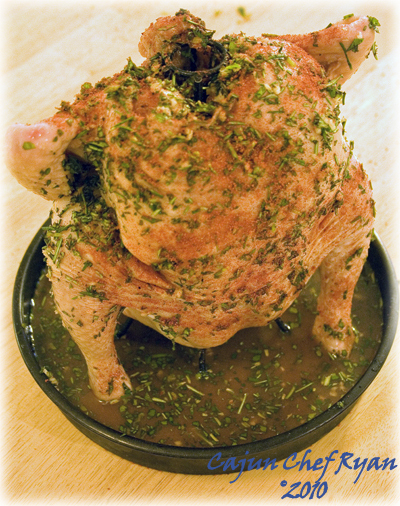 Then evenly coat and rub the fresh herbs mixture into the cavity and outside skin surfaces of the chicken. 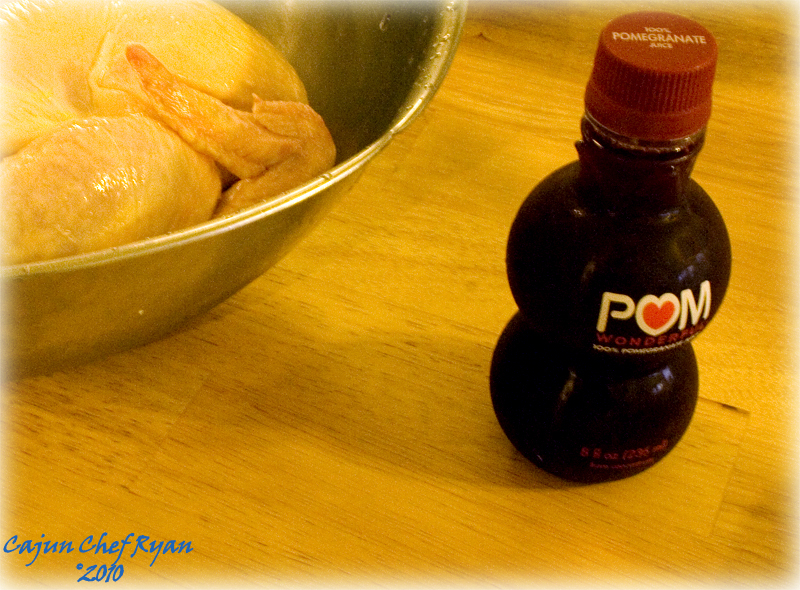 Place the chicken on an upright stand with the base underneath, and then gradually pour in the marinade into the base. 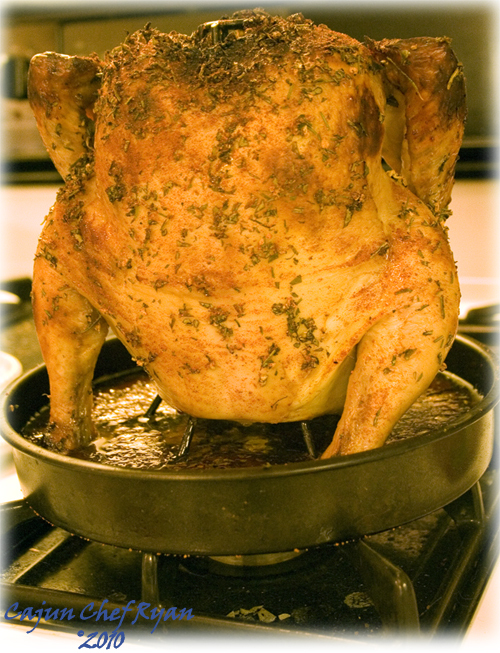 Place the chicken in the pre-heated oven and roast for an hour and thirty minutes, or until chicken is cooked through. Allow the chicken to sit for 10 minutes before carving, and then serve with your favorite side dishes. To Serve: Cut into individual pieces, 2 legs, 2 thighs, 2 wings, and 2 breasts. Yield: 4 to 8 servings, depending on portion size. Wow, that marinade sounds wonderful, I never would have thought to use pomegranate juice! Your Finger Lickin Rub also sounds very tasty! So glad to hear that you like the recipe with the Pom juice, and the rub. I love love love the addition of Pomegranate juice! So creative!!! what a gorgeous color in this bird and so well prepared love the sauce and herb nice job! Hi CCR – I bet it tasted awesome with that marinade! I’d like having POM here to taste this wonderful chicken!! Yummy, sounds like a plan for me to make this dish on the weekend. Looks like a terrific recipe, Ryan. This roast chicken sounds so flavorful with the POM and spices. Pairing it with rice is wonderful! There’s nothing on your site I don’t want to try, I will be busy cooking this weekend! Sounds interesting with pomegranate juice, does it add a tart flavor? The pomegranate juice does impart a slight tartness to the sauce, but is not overpowering in any way.